The Lakeview Lawns venue has a spectacular view of the Hussain Sagar and Biggest Indian flag. 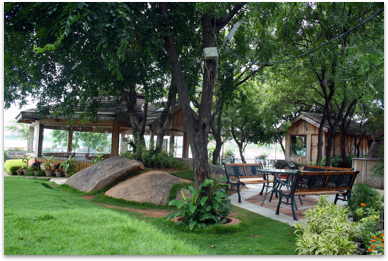 It has got huge Lawns lined by coconut and palm trees with huge partly covered dining area surrounded by lush green palms, and is a refreshing oasis in the heart of Hyderabad and Secunderabad. This has got grand entry over looking wave pool with beautiful parking beneath the trees. This venue is perfect for birthday parties, Sangeeth, wedding Reception and any kind of corporate Events, easily accessible and supported by 24x7 power backup. The Glass House is a cozy waterfront location with a panoramic view of Hyderabad's famous Tank Bund, Buddha Statue, Birla Minder and the biggest Indian flag. An air-conditioned wooden hut lies amidst the lush greens of the venue, facing the waterfront with water falls on naturally formed rocks. This calming venue is perfect for all kinds of events, from Baby Shower, cradle ceremony, Birthday Parts, Kitty Partys, wedding-related activities like Engagement Party, Sangeeth and Mehendi ceremonies, wedding Reception to formal corporate get-togethers. It is easily accessible, supported by 24x7 power backup and has an ample parking space. Since we cannot express the beauty of the place in words please come and experience it yourself. 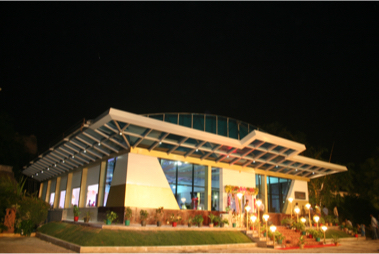 Jalavihar offers GRAND LAWNS with fully Air Conditioned conventional Halls with partly covered Dining hall that can accommodate 3000 Plus guests. The GRAND LAWNS is a wonderful stretch of greenery equipped with facilities to contain large crowds out in the open air with the cool breeze sweeping over you. 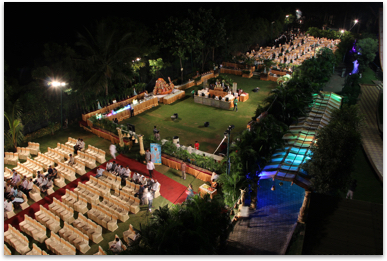 This is the ideal venue for all grand weddings and large gatherings. You and your guests will be awe struck with the beauty of the place paired with our efficient organization! You are welcome and plan your next event and make your event the perfect one. It is easily accessible, supported by 24x7 power backup and has an ample parking space. VEDIKA, the air conditioned Venue with spectacular water front and Biggest Indian flag view is characterized by a simple yet elegant modern design along with partly covered dining hall surrounded by lush green Palms and Trees. 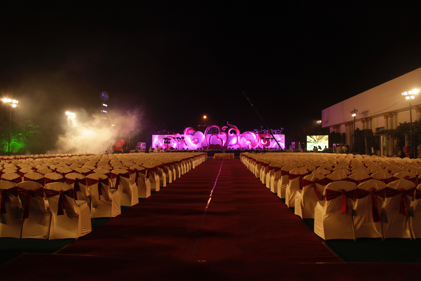 This versatile venue can host all kinds of events, from Baby Shower, cradle ceremony, Birthday Parties, engagement Party, Sangeeth, Mehendi, Wedding’s (Both Day and Night weddings ), wedding Receptions to formal corporate get-togethers. It is easily accessible, supported by 24x7 power backup and has an ample parking space. Give us a ring & let the picnic begin!